This one-pan meal is very easy to throw together. Use any vegetables you like to switch up the flavors! Pro-tip: try veggies that last a long time. Peel and chop sweet potatoes, slice brussels sprouts. 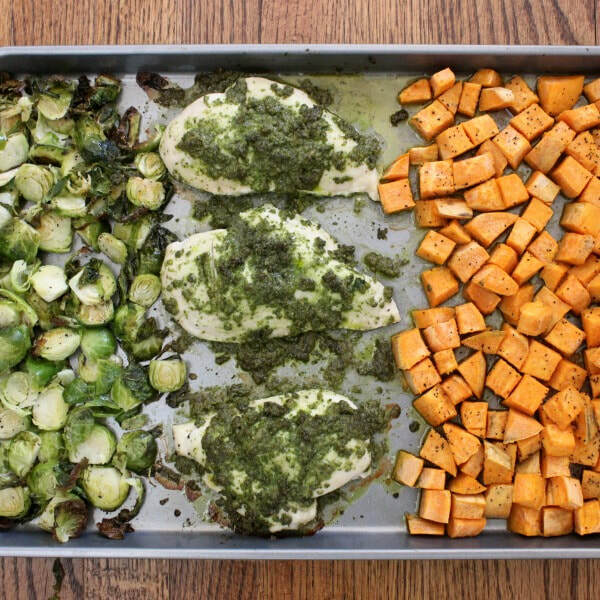 Place sweet potatoes and brussels sprouts on opposite sides of a large baking sheet. Pour 1 tsp olive oil and 1 tsp garlic powder over each set of veggies. Toss to coat evenly. Place chicken in the center of your baking sheet, and coat both sides with basil pesto. Place sheet in the oven for 30-40 minutes, or until the juice of the thickest chicken breast runs clear.